We all know that pets need to manicured regularly. But there always difficuties in trimming them. Here you get a perfect tool. This nail trimmer for pets has LED light and a 5X magnification, helps you see clearly where to cute, makes nail-trimming safer and easier. The bright LED light make sure you see exactly where need to cut. 5x magnififation mirror help see things up close and reduce the risk of cutting too deep. With a nail trapper, no need to clean up nails trimming off the floor and clothes. Non-slip srip for easy handling, easy to use. 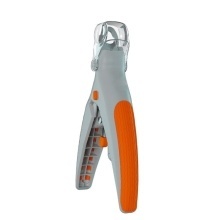 Stainless-steel, sharp enough to trim the pet&apos;s nails cleanly, evenly and quickly. Lightweight and compact, convenient to store. 3 batteries are needed to get LED light work, which is NOT included in the package.